Darcy Camargo: The Tangle is a complex mathematical object. It has a random structure defined by a separate random agent: the random walk. This makes its study challenging, but also very interesting. In order to systematically study the Tangle and its associated problems, we must first understand its structure. 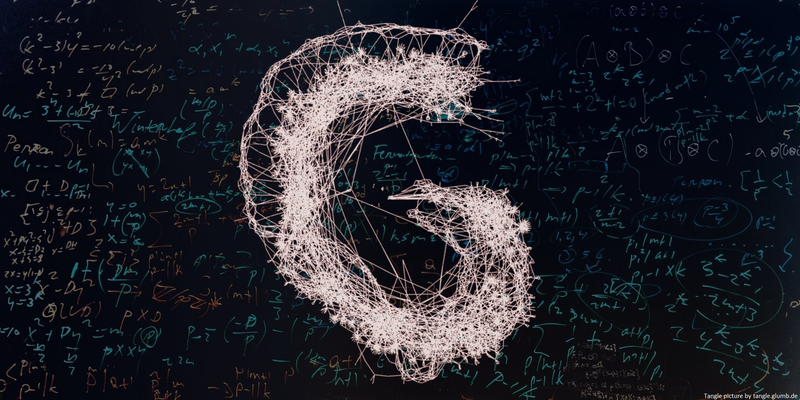 This post presents a brief introduction on the different behaviors we expect from the Tangle depending on alpha, the parameter of the random walk, especially considering the number of tips and of stability its structure over time. In this post I assume the reader has knowledge on what is the Tangle, how the random walk is used to select tips and what reattachment is. Alon Gal’s postabout alpha and randomness is also recommended. Recurrence and transience are terms widely used in probability theory. Here I will give some context on what those terms means for the Tangle. One example of Tangle with the value of L(t). 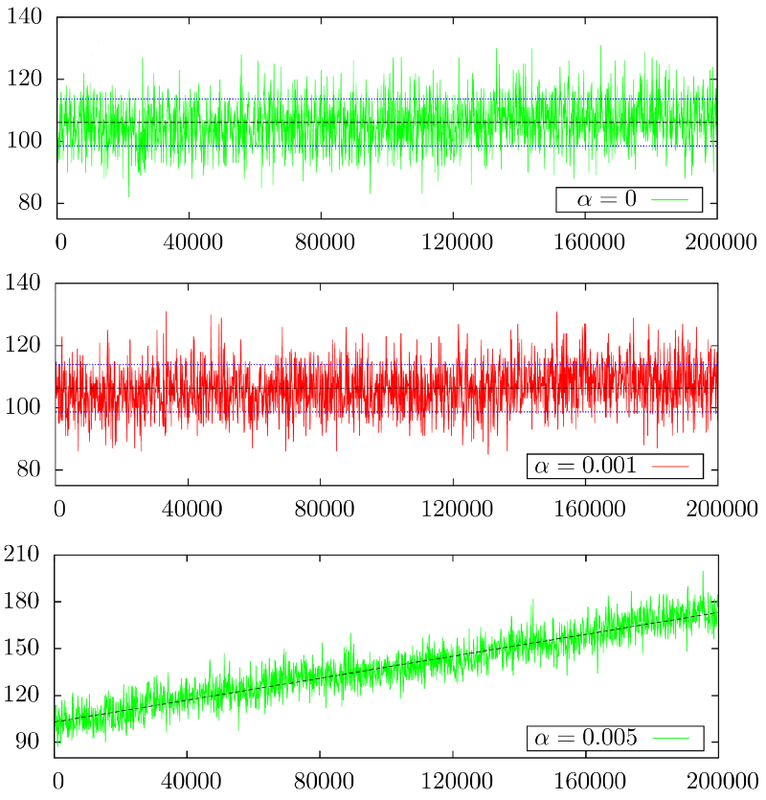 The behavior of L(t) over time for three different values of alpha over 200,000 transactions. For α=0.001 the slope of the average is so small that is not visible with just 200,000 transactions. Observe that for α=0.005 under 0.1% of the transactions are tips by the end. The number of tips L(t) is recurrent for a tip selection if the average number of tips over time stays controlled (bounded). The number of tips L(t) is transient for a tip selection if the average number of tips over time grows with no bounds. For α=0 the Tangle is recurrent (proved). For α>0 the Tangle is transient (conjecture supported by simulations). This means that we actually do not expect to have recurrence for practical uses of the Tangle, and the number of tips will grow! Is this a problem? Is the number of tips growing over time a problem? Naturally, a large number of left-behind transactions is not ideal. However, the Tangle employs a very small alpha value, making the growth of the number tips quite slow, so the few transactions that get left behind just need to reattach. The behavior we want is the Tangle growing in a stable way, with no recent transactions approving old ones. We call this asymptotic stationarity, or simply stationarity. This means that after some time, the Tangle’s structure will no longer depend on its distant past. This implies that a transaction will quickly become approved or abandoned. This behavior is desired, as the user can quickly decide whether a re-attachment is necessary. 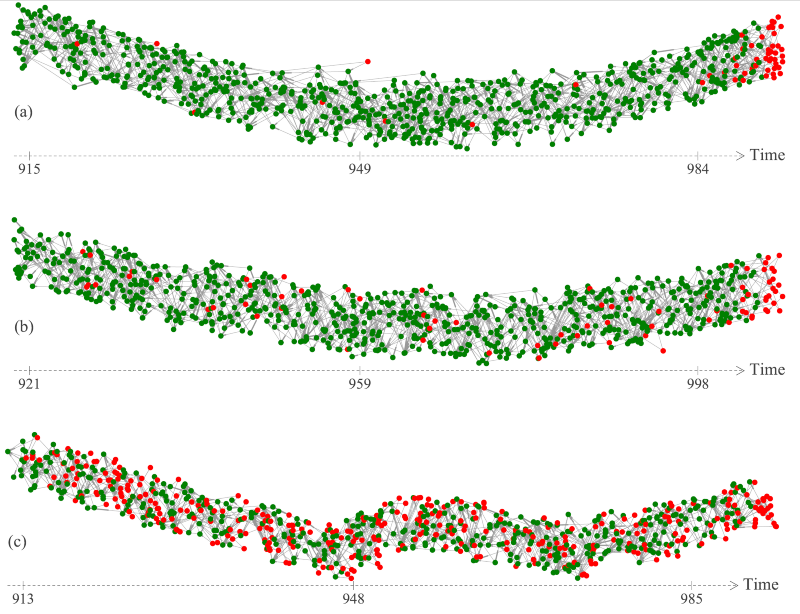 Some simulations of the Tangle by Bartosz Kusmierz using (a) α = 0.05, (b) α = 0.1 and (c) α = 0.5. The large values of alpha make the Tangle leave many transactions behind, but it still grows in a stable way, with no recent tips approving old transactions. This is possible even with transience! What happens is that even though we have transactions getting left behind, the exponential function of the random walk decreases the probability of approving these transactions over time, so the majority of probability is concentrated within the most recent tips. This keeps recent transactions from approving old ones, and contributes to the good behavior we aim for. The value of alpha affects the Tangle’s behavior in many ways. For any positive alpha we have transience, but this does not affect stationarity and consequently the Tangle is kept stable over time. Furthermore, for positive alpha the number of tips is slowly increasing in time, which, in practice, implies that occasional reattachments are necessary. Finally we should remember that alpha plays a role of security against lazy tips and parasite subtangles, so research about alpha tries to discover how small alpha can be allowed to be, while maintain the security attributes of the Tangle. All over the world there are regional groups of IOTA supporters. So of course also in South America. Here is a group called IOTA Hispano http://www.iotahispano.com . One member of this group is Gabriela Jara. publicIOTA had the opportunity to interview her. publicIOTA: Gabriela, first of all many thanks for your willingness to have an interview with us. We hope you are fine. Gabriela, can you tell us something about you and your education? Gabriela Jara: Well, I was born at a southern province of Argentina, Santa Cruz. I´m the oldest of three sisters. I have been studying English since I was in elementary school and also took some piano classes. I graduated from High School and took a sabbatic year, then I begun to study a technical degree on Safety and Hygiene at workplace. Later on, I moved to Bariloche, where I started a family and had two boys. Once settled, I studied pharmacy and Sign Language. I like the social work, I like to think that we can all do things for the sake of others, even if they are small actions. I can say my hobbies are reading and also I’m constantly searching for ways to give the next generation a better future. Currently I’m working as a Sign Language Teacher, I write for IOTA Hispano and make interviews. Recently started a project called Tangle Patagonia, as a contact platform that allows me to give talks and organize events regarding IOTA. I want to be part of this change of mind that is being generated worldwide, where technology is getting more and more into our lives to improve it. I think IOTA is going to improve every aspect of our daily lives and it is necessary for people to know what IOTA, Tangle and the Internet of things is all about. publicIOTA: How did you hear about IOTA? Gabriela Jara: The first crypto I found out about was Bitcoin in 2013, I was curious about it but dismissed the idea because I was told BTC was related to drug dealers and guns. At the beginning of last year, a friend from Mexico told me she was buying BTC so my interest resurfaced. I joined a Facebook group and opened an Exchange account at the same time I was learning about it. At August of last year I read a post talking about IOTA, the first thing that caught my attention was that it had no fees. I remember thinking I had to investigate more about this coin because I wasn’t a fan of paying so much fees with BTC. The more I read about IOTA the more I liked it. I think in order to make a revolution happen, we first have to change our mind and look beyond our noses. The first thing that caught my attention when I first read about Cryptos was that they will allow us to make transactions without the dependence of Banks or a centralized organism, and that if we want to send money to another country, even if this country is at the other side of the world, we would’t have to wait long times or pay high rates for the transaction to reach its destination. 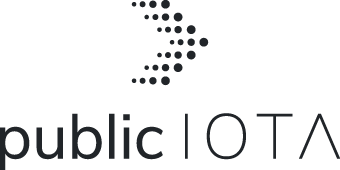 publicIOTA: You are writing for IOTA Hispano and a member of IOTA Evangelist Network. How did it come about and what are your goals? Gabriela Jara: One day I read a post in Facebook of Daniel De Michele (Carpincho Dem) that went something like „I think I want to create a web page with the news about IOTA in Spanish, who wants to help translating the articles?“. I started to think about it and a couple of days later joined the team. IOTA Hispano started as a project for the people in Latam that wanted to find IOTA news in Spanish, we were the first page doing this. Early this year, Carpincho came up with the idea of making interviews to people around the IOTA Ecosystem (besides of being the founder of IOTA Hispano, he is also the ideas guy behind all the work). That was a huge change for us, Carpincho decided to publish the interviews in English and Spanish simultaneously. After that, IOTA Hispano began to be read not only in Latin America, but also by the iota community from all around the world. Now we are a staff of 7 members writing and working on interviews with people of the IOTA Foundation, IEN members, developers, partners of IOTA, and more. The goal is to help people learn about this great project that is IOTA . Again, in the middle of the story of becoming an IEN member appears my friend and colleague Daniel De Michele, He is a great enabler who is always encouraging us to go for more. I assume he saw my enthusiasm and my love for IOTA and the Economy of Things, and told me I needed to go for it. So I postulated. IEN made me two interviews (I was very nervous!) and after a few hours Jay Morton told me I was in. This was on the same day Daniel made Kevin Chen (Founder and Head of the IOTA Evangelistic Network) an interview. I was so delighted, I’ll never forget that date. publicIOTA: What are you and IOTA Hispano doing to achieve your goals? 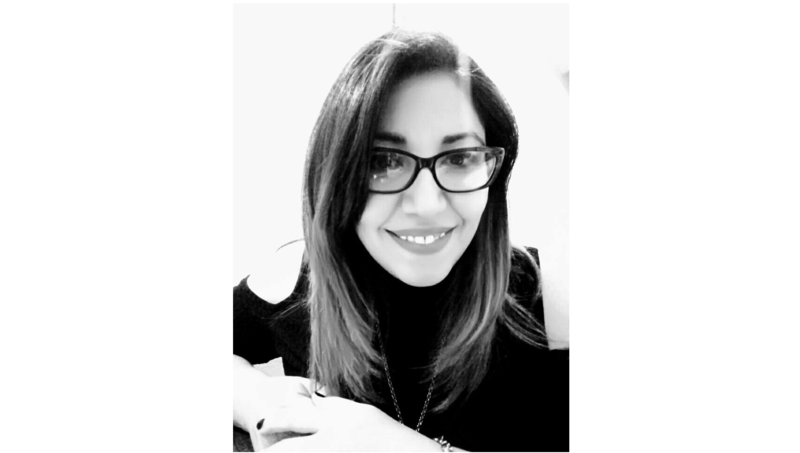 Gabriela Jara: We are working on spreading the word about IOTA, that’s our primary goal. This is the reason why we are reaching out to those involved in the IOTA ecosystem. To make their work known by more people. Also we are using meetups as a tool to meet people interested in this protocol. On the 25th of July we will have another one in Buenos Aires and and we will have the pleasure of having Sergei Popov as one of the main speakers. Soon we will give more details of it. Here in Bariloche I’m working with my project Tangle Patagonia, advising a couple of people how to implement IOTA in their projects and showing them the benefits of working with the IOTA/Tangle. publicIOTA: Where do you see the great strengths of IOTA, what will bring IOTA for the future? Gabriela Jara: I think IOTA has managed to work on every aspect that other cryptos lack off. Other cryptos like Bitcoin and Ethereum were the pioneers, they were the ones that opened the road for IOTA but if they can’t manage to do the improvements they need to, they will only be remember as that, the pioneers. Every day I have the privilege and the opportunity to see so many real use cases. 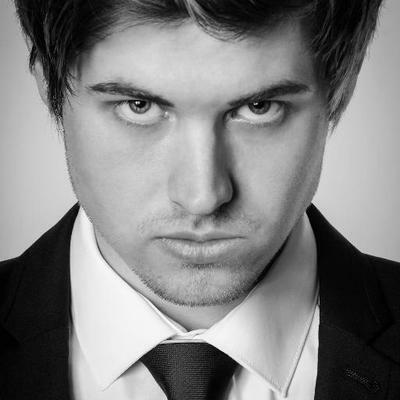 Look up for Daniel Trauth, working with IOTA applied to machinery and fineblanking. The goal of this PoC is to extract production data of fineblanked components from the machine control in real time, store them encrypted in the tangle and retrieve them via a web-based frontend. Green Protocol (Darren Olsen) making crazy things to his own house like someone watering his plants remotely while he is on vacations and will pay whoever do the job with IOTA , BiiLabs working with Taipei to build a smart city and there are so much. IOTA will bring great improvements there is so much areas where IOTA can be used to generate value and benefits for humans that will help us tackle big problems from education to medical care, from reducing hunger to creating Smart Cities and many more that we cannot imagine yet. In a few years we all can be enjoying the benefits of this technology, so why don’t start from now . publicIOTA: At the end a private question, do you like soccer and the World Cup? Who will be world champion in your view? Gabriela Jara: I like soccer but now that Argentina is no longer playing, watching the games is not as fun as it used to when we were still there. Since we lost against France, I think I will cheer up for Belgium! Mark Schmidt is a cryptocurrency enthusiast and entrepreneur. 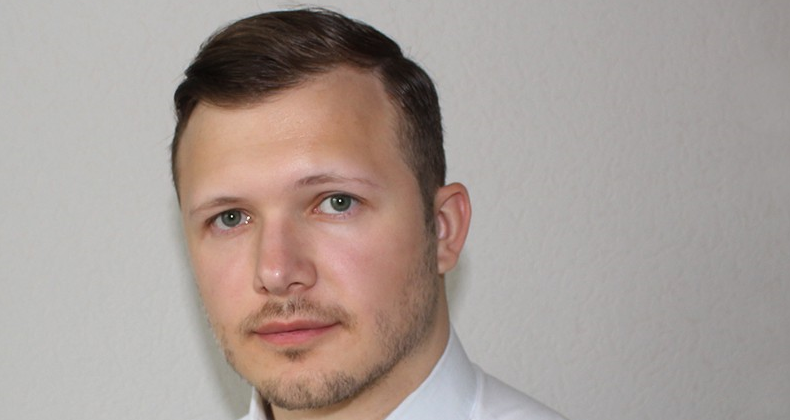 He studied Business Administration at the University of Hamburg and founded several startups — ranging from on demand parceling services, affiliate websites, to developing mobile applications. While still in his teens, he managed professional e-sports teams, such as Trademark Gamers and ASUS. Ever since, Mark has given breath to new projects and startups. Currently, Mark is located in Hamburg, Germany. I have been closely following the cryptocurrency space since 2011, and in all that time, the only project to ever given me goosebumps was IOTA, both for its technological promise and its vision of the future. I am incredibly honored and excited to be joining the IOTA Foundation. It is my sincere hope and goal to help in my capacity as the Community Manager to make IOTA’s vision become a reality. Mark’s background in management makes him a great asset to the IOTA Foundation as we expand our interaction and engagement with the broader ecosystem, which is an essential element of IOTA’s success. The community manager role is designed to help facilitate ecosystem efforts on both the development and community sides. Mark will ensure that community questions and concerns are being adequately met and serve as a contact point for individuals who are active in their localities. Please give him a warm welcome! With the research, development and ecosystem around the IOTA project really beginning to flourish, and with nearly three years having past since it was first announced to the world, I thought it would be a good time to reflect back on how we got here. This blog post aims to shed some more light on the history of the IOTA project and why we have chosen the research and development approach that we have. It was around four years agowhen some of the ideas around a distributed ledger architecture based on a Directed Acyclic Graph (as opposed to a chain) began to be discussed on various Nxt and Bitcointalk forums. The blockchain scaling problem which really came to a head many years later was already well understood at the time. It is not incredibly hard to see that the chain of blocks of finite size, which can only be produced at regular discrete time intervals, produces a throughput bottleneck and leads to high transaction fees that need to be paid to the miners (which is by design). If you wanted to remove the fees and allow the system to scale, the natural idea would thus be to eliminate the bottleneck and the miners. This is, of course, easier said than done — it raises all sorts of new questions. Where should the next block/transaction/vertex be attached? Who will vet the transactions for consistency and why? How can it be secure against possible attacks? How will consensus be achieved? These questions don’t have trivial answers. It was only after over a year of intense thought, discussion and deliberation that the IOTA founders came up with the idea for an architecture which could potentially resolve these issues. In this system, each transaction (represented by a vertex in the graph) would approve two previous transactions it selects using a particular class of random walk. 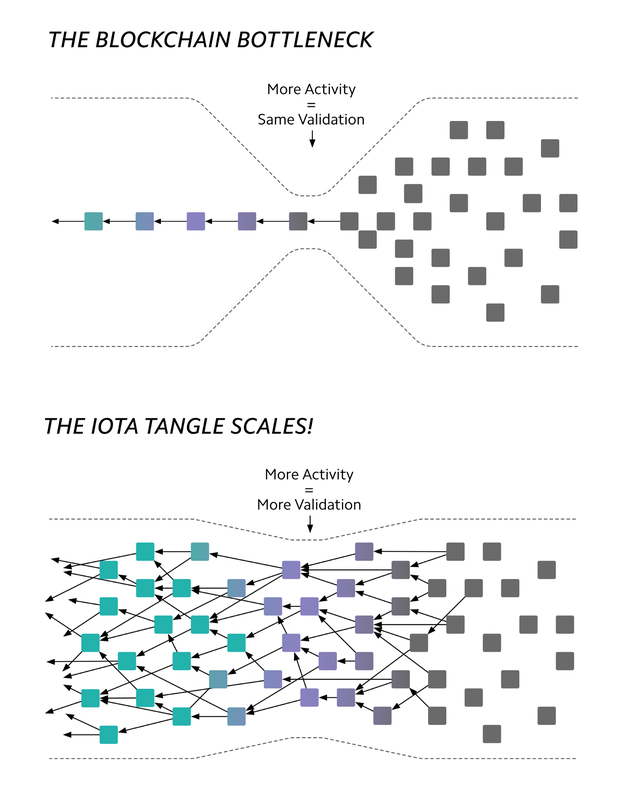 This became the mathematical model we now all know as the Tangle and it serves as the foundation for the IOTA core protocol. 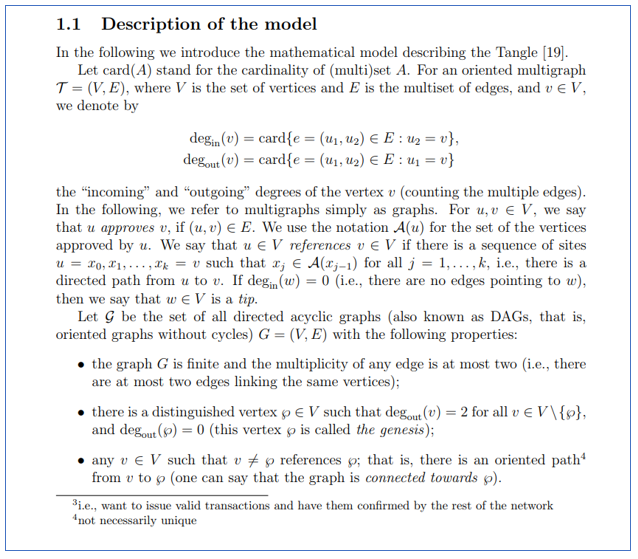 It has been almost three years since the first draft of the Tangle white paper describing this mathematical model was published and it has since taken on a life of its own — the original white paper has gone through many revisions thanks to the many people who suggested numerous improvements (see the “Acknowledgements” section in the end — I take this occasion to give thanks to all people who provided invaluable feedback), it has been cited quite a few times in other research papers, and has spawned an ever expanding number of follow-up papers written by both researchers at the IOTA Foundation and independent ones further investigating the properties of this unique architecture. 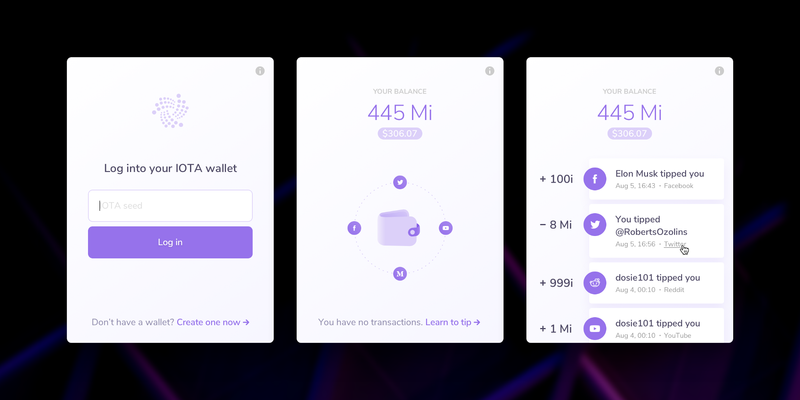 The goal was to create a decentralized system which could scale and eliminate transaction fees — no easy task. To eliminate the transaction fees, we had to first eliminate the miners — after all, if you want to design a feeless system, you cannot have a dichotomy of “miners” who serve the “simple users”. This bifurcation of roles between the miners and transactors naturally leads to transaction fees because the miners have some kind of resource that others don’t have and they will use this monopoly power to extract rents (in the form of transaction fees, block rewards, or both). Therefore, to eliminate the fees, all the users (i.e., you) would have to fend for themselves. Our idea was to come up with a system where the main principle is “Help others, and others will help you” (you can think of it like a pay-it-forward model). You can help others by approving their transactions; others can help you by approving your transactions. Let us call ‘tips’ the transactions which don’t yet have any approvals; all new-coming transactions are tips at first. The idea is that, by approving a transaction, you also indirectly approve all its “predecessors”. It is intuitively clear that to help the system progress, the incoming transactions must approve tips because this adds new information to the system. However, due to the network delays, it is not practical to imposethat this must happen — how can you be sure that what you believe to be a tip has not already been approved by someone else maybe 0.1 seconds ago? Instead, it is all about the approval strategies — sometimes (well, in fact, most of the time) we use the term “tip selection”, but it is important to note that the participants of the network are not obliged to select the tips; we would like to impose that everybody should do so, only we can’t. If everybody collaborates with everybody — only approving recent and good (non-contradicting) transactions, then we are in a good shape. On the other hand, for someone who only cares about themself, a natural strategy would just be to choose a couple of old transactions and approve them all the time without having to do the more cumbersome work of checking new transactions for consistency thereby adding new information to the system. If everybody behaves in this way, then no new transactions will be approved, and the network will effectively come to a halt. Thus, if we want it to work, we need to incentivizethe participants to collaborate and approve each other’s recent transactions. Yes, once again, in the end, it is all about the incentives. Everybody wants to be helped by others, but, not everybody cares about helping others themselves. To resolve this without having to introduce monetary rewards, we could instead think of a reward as simply not being punished by others. We need to slightly amend our main principle — it now reads: “Help others, and the others will help you; however, if you choose not to help others, others will not help you either”. When a new transaction references two previous transactions, it is a statement of “I vouch for these transactions which have not been vouched for before, as well as all their predecessors, and their success is tied to my success.” Unfortunately as humans, none of us can choose our parents and ancestry, but in the world of IOTA you can — so choose wisely . In the IoT environment it is reasonable to assume that a good proportion of the network participants will follow the “recommended” (by whom? by m̶e̶ ̶C̶o̶m̶e̶-̶f̶r̶o̶m̶-̶B̶e̶y̶o̶n̶d̶ the IOTA Foundation, of course ) tip selection strategy. Our task is thus to design this strategy in such a way that it is advantageous for everybody to use it as well (provided that at least a good part of the others do as well). After many discussions and failed attempts, we concluded the Markov Chain Monte Carlo (MCMC) tip selection algorithm (more precisely, the family of tip selection algorithms) at the heart of the Tangle would have these properties. What Purpose Does a Mathematical Model Have? The Tangle as a mathematical model is both very simple and incredibly complicated. It is very simple because there is only one rule which is really imposed: a transaction must approve (validate) two older transactions. It is incredibly complicated because the nodes of the network are free to choose these two transactions in any way they like, and this can make the topology (i.e., grosso modo, the way how the transactions are connected to each other) of the Tangle very messy. Even if we assume that everybody follows the same tip selection strategy, the resulting graph is random, with a structure which is quite difficult to access. As argued in the paper, a good choice of the tips selection strategy is doing a “random walk towards the tips” (a.k.a. MCMC) — so, mathematically speaking, we are dealing with Markov chains in random environments, and models of this sort are notoriously difficult. Believe me, Markov processes in random environments are one of the main topics of my “pure math” research, so I do know a fair bit about this. If anyone thinks it is actually not so difficult — try to prove the stability of the number of tips for alpha=0. To be precise, assume that the tip selection is made by a simple random walk towards the tips (so it is independent of cumulative weights), and prove that the expected number of tips at time t is uniformly bounded by a constant. It is something that seems to be almost intuitively obvious, and it is indeed confirmed by simulations, but try to prove it rigorously. This can be done — my former student, Darcy Camargo, was able to do it just recently (a very impressive display of his mathematical prowess). And, if the above is too easy for you, then try to prove Conjecture 1.1 in Equilibria in the Tangle. But on the subject of proofs — as you may know, I am a research mathematician working in the area of Markov processes and related things. I have proved many theorems in my life. Coming from me, this may sound particularly surprising, but still: do not overestimate the importance of mathematical proofs in the real world. OK, proofs are important, and, even more importantly, proofs are frequently beautiful. But, to prove anything, you need first to set up a mathematical model based on assumptions, and these models never reflect the reality in a completely accurate way. The real world is too messy and complicated for these simplifying assumptions. The other founders behind the IOTA project and I have always appreciated that in order to engineer and build something for the real world, an iterative development process would be necessary, bootstrapping the development with certain safety rails along the way (e.g. the Coordinator), while continuously analyzing, critiquing and improving our understanding of the system. This is simply the nature of engineering. A protocol like IOTA doesn’t live on a piece of paper or on a whiteboard, but in real world where many of the assumptions of an abstract mathematical model — the Tangle — fall apart. Mathematical models, proofs and theorems can be extremely valuable, but it is also very important to appreciate their limitations. Any white paper which claims to have proven everything about the behavior of a system which will exist not as an abstract idea, but rather as a real world implementation, is either clairvoyant or (more likely) just naive. 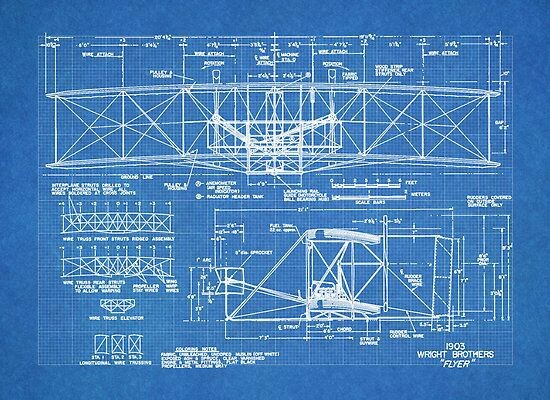 One can try to write technical specifications and prove every aspect about the design and safety of an airplane, but until it has actually been built and you can see it fly, caution must be exercised before making any sweeping claims about its flight-readiness. Please don’t get me wrong: the above is not, by any means, license to not care about proofs. But when we don’t have a completely rigorous mathematical proof of a desired statement such as “The Tangle is provably secure”, (or maybe we do, but in the context of oversimplified mathematical model), this means that we have to work hard to find nonmathematical ones. Run many simulations of everything, construct other mathematical models which are more adequate and/or tractable, imagine every possible kind of attack on the system and figure out why they will not work (or figure out why they will and then make amendments to defend against them), and so on. Also, we need to incentivizethe external research on all this (expect interesting news in this direction soon). As of today, there are many cryptocurrency systems around. They mostly share one common feature: all participants of the network interpret the same ledger in the same way. In this paper, we introduce the idea of local modifiers: the nodes of the network can interact with the ledger in different ways, depending on various kinds of information locally available to them. We then argue that such an approach permits to increase the security and the scalability of the Tangle. What we seek to do in that paper is to further strengthen the tip selection algorithm, introducing also the “local view of the nodes” (specifically, the time when a node received a particular transaction) into play. This approach seems to be quite effective against many attacks of the type “do-something-secretly-then-broadcast” (these include the double-spending “parasite chain” attack and also the “splitting attack” described in the Tangle white paper). It is important to stress that we do not seek to replace the MCMC tip selection algorithm, but rather, in the spirit of iterative development, to amend it in our never-ending pursuit to improve the protocol and make it more secure. While there is still more research to be done on Local Modifiers before we can confidently say whether they are an improvement to the existing tip selection algorithm and that they will be incorporated into the recommended IOTA tip selection strategy, we share our research and development early and often in the spirit and ethos of open source. By doing so, we give an opportunity to our amazing ecosystem of researchers and developers to help contribute to the protocol’s evolution. Indeed, the IOTA project would be nowhere today if it were not for these contributions to the project from the IOTA Ecosystem. Building a protocol to enable secure, feeless, and decentralized value and data exchange for the Internet of Things is not something that happens in a night, in a year, or even three years. It is not something where all of the desired properties (security, “good” Nash Equilibrium, scalability, etc.) can be proven in a white paper. And it is not something that can be done in the Cathedral. The ideas described in the Bitcoin white paper were truly brilliant and it is absolutely remarkable to see what the manifestation of those ideas have become today. But even the great Satoshi Nakamoto (whoever he/she/they may be) failed to consider some crucial flaws in Bitcoin’s design. For us to achieve our vision to make IOTA the backbone protocol for IoT, we, the researchers and engineers at the IOTA Foundation, as well as all the independent researchers and engineers in the IOTA Ecosystem contributing to the project, must do everything we can to make sure the IOTA core protocol is truly built to last. Like the Internet Protocol itself, the research on the IOTA protocol will continue, there will always be room for improvements, and it will need to evolve to meet the changing demands of a constantly evolving world. This is simply the nature of any protocol because a protocol is nothing more than a shared language — a commonly accepted set of rules to allow us to share information, and in the case of IOTA, also value. Like any language though, these are living things and they evolve over time. With the incredible team being assembled at the IOTA Foundation along with the burgeoning ecosystem of researchers, developers, corporations and other contributors to the project, we know we can build IOTA to meet the needs of Internet of Things industry and help it to evolve to power the machine economy of the future. „As of May 30, 2018, IOTA’s price was $1.62. By July 1, 2018, IOTA’s price per unit is expected to range from $0.87 to $2, according to our panelists. 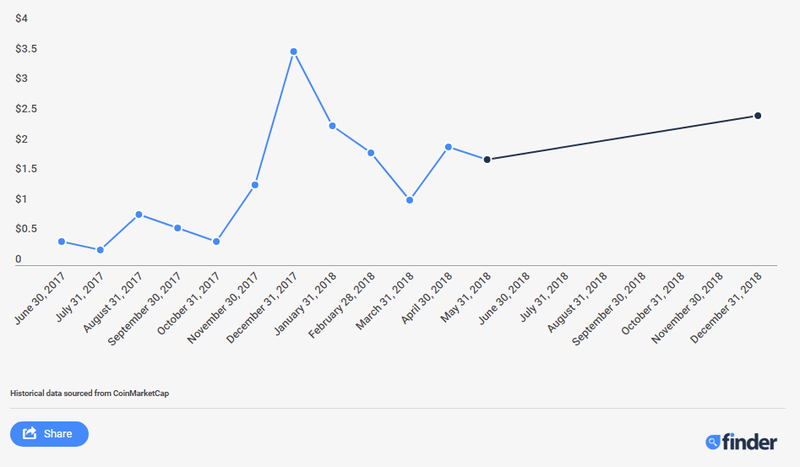 When it comes to our panel’s end-of-year expectations, Kunal Patel holds the lowest prediction at $0.50, while the highest comes from Alisa Gus. We are delighted to announce that the first wave of verification has been a success for omoku! More than 500 users have already been verified. If you are one of them, you can now link your IOTA addresses and your bank account with omoku. In this article you will find out exactly how this works and what you need to consider. As more than a month has passed since the last update in the omoku blog, we would like to take a brief look back at the progress that has been made in the meantime. Above all, we are enthusiastic about the numerous applications for verification. We now have over 500 verified users on omoku. Some users had some problems and consequently longer waiting times until the verification was successful, but we were all able to fix these issues relatively fast. By and large, the first wave of verifications was very successful. Our decision to take a gradual approach to building omoku has proved to be the right one for us, as it allows us to eliminate possible weak points in the system directly and without major impact. After the account security could be guaranteed by 2FA and a recommendation system is also already in use, all our efforts are now directed towards building and releasing the actual Exchange. We do not carry any balance for our users, neither in Euro nor in IOTA. This means that you must have your own IOTA Wallet and therefore also your own IOTA address. If you do not yet have an IOTA Wallet, you will find here all details on how to create one. If you have any questions, we will be happy to help you. Connecting at least one IOTA address and an own bank account with omoku is a prerequisite to buy or sell IOTA on omoku. Please make sure that you are verified first as you can also only connect your IOTA addresses and your bank account to omoku with a verified account. If you are already verified, you can make the connection without further delay. Otherwise, please follow the instructions on the verification page after registration or login. If you have any questions or problems, please contact us. As soon as your verification has been confirmed, you can add your IOTA addresses and bank accounts without further delay. A complete (full) verification is not necessary. How do I use the omoku connector? Use a verified account to access the Connector page, which is on the same page as your settings. You can also reach the page via your profile or navigation. In the connector you can now add a new IOTA address. The validity of the IOTA address is automatically checked during entry. If your address is valid, the IOTA icon before the address switches from grey to blue. It’s very simple to connect your IOTA wallet with omoku. You can add up to 20 different IOTA addresses from different IOTA Wallets and delete obsolete addresses at any time. Enter any label for the corresponding IOTA address and then insert your IOTA address. As soon as you confirm your entry with “Add now”, your IOTA address appears under the connected addresses. Similarly, add your bank account. Simply enter your IBAN and the corresponding BIC. If you do not know your bank’s BIC, you can find out here. Connect your bank account with omoku. If desired, you can add several bank accounts. Then you should select one of them as main bank account. To do so, simply click on the star next to the relevant bank account and then confirm your selection. The main bank account is used for payments of rewards for referrals. Choose a main bank account where you receive the reward for you referrals. When connecting a bank account with omoku, please note that for legal reasons the bank account must be in your name, which you entered during verification. In addition, it must be a bank account in the SEPA area with a valid IBAN so that we can successfully complete your transactions or send you your reward from referrals. Omoku also assumes no liability for losses of IOTA caused by double spending. Double spending can be prevented by using at least two different IOTA wallets. Connect a IOTA Wallet with omoku, with which you do not carry out an outgoing transaction, i.e. do not send IOTA tokens to another Wallet.